Thistechnologicallinehasauniversal high-performing system and thanks to its modular design and wide range of options, can be used for producing cream honey, both in large and small quantities, regardless of the quality of the initial product. The plant is a universal high-performance system and thanks to its modular design and a wide range of options, can be used for producing cream honey, both in large and small quantities, regardless of the quality of the initial product. The plant features an automatic control system, which allows programming the required mode of honey processing. It’s intended for packing the finished product in a large industrial container by weight principle. Model AP drum fillers are designed for high- output, semi-automatic, bulk packaging of honey. The filler consists of a platform with a tensometric (weight-measuring) system, loading rollers, a dosing system based on an impeller pump, peristatic pump, or piston pump, piping and valving, and a control system. Turbo-melterpre-meltslargehoneycrystals, mixes honey and improves its structure and consistency, preparing for further homogenization. It is equipped with a screw agitator for an effective stirring. 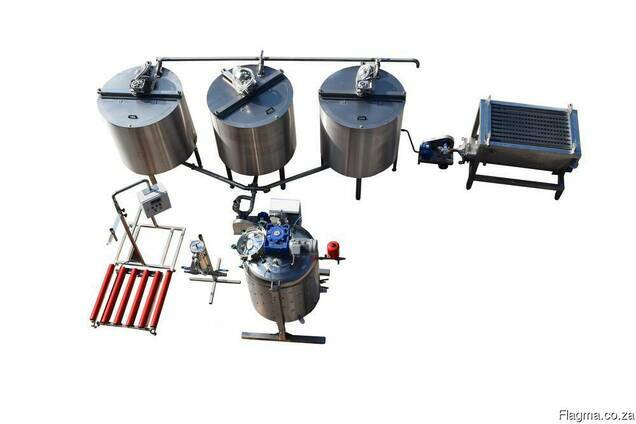 The equipment consists of a hopper, volume of which can be changed upon request, a heated body (with a jacket for heating with hot water, or heating coils) and a twin screw working elements. Depending on the required performance, the TurboMelter can be made for batch or continuous processing. The equipment is used for mixing and homoge- nizing different kinds of honey to get the product with homogeneous properties. The vertical wor- king vessel has a screw agitator and a jacketed design. The plant is a universal high-performance system and thanks to its modular design and a wide range of options, can be used for producing cream honey, both in large and small quantities, regardless of the quality of the initial product.